On-site there is a fully equipped spacious communal kitchen. There are cookers, washing machine, tumble drier, kettles toasters, pots and pans, crockery and cutlery. There are tables and chairs in there and there is a TV at the back of the kitchen so that you can catch up with the news or keep the kids entertained at Breakfast time. Our site is very family friendly and the toilet and shower block has special family shower rooms so that you can deal with all the family in one place. Each shower room has a heater, soap dispensers and dyson hand driers. Hair driers with mirrors are in the ladies toilet areas. All facilities in the kitchen and shower block are for everyone to use. The washing machine and tumble drier are coin operated. £3 per wash and £1 buys 20 minutes of drying time. The kitchen and shower block are open 24 hours per day. We also have four BBQ huts on site that can be hired. 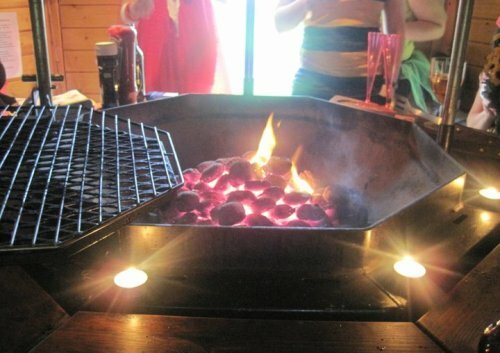 The huts are spacious, all have electricity and have a charcoal BBQ in the middle with seating area around it. You can cook your supper on the BBQ and then use the hut as a base to socialise with your family and friends. They can be the answer to our less than perfect weather! If you book the hut you get exclusive use of it for the whole evening and then hand the key back to the shop in the morning. Charcoal and firelighters are included in there so thats another thing you dont need to think about ! Tw o of the Huts have electricity and the glass one is perfect with tea lights! Bookings must be made in advance of arrival. The cost is £25 for the hire of the hut for the evening. Remember there are only three and it is a first come first served basis! If you cant be bothered to cook for yourselves then the Licensed Cafe/Bistro is open from 9 a.m. and serve breakfasts in there until 10.30 a.m. We also serve light lunches, coffees and homebaking and afternoon teas! We close at 4 p.m. There is a childrens play area on site where the kids can let off steam and enjoy themselves.